The final ruling of the Board of Industry Appeals found that a Dutch Pension Fund could invest in gold. The court found that because of the crash of 2008 and the euro crisis, the pension fund should be able to have the flexibility to take care of their clients. This is a defeat for that country’s Central Bank. Now, getting their hands on the gold is another matter. It appears some of the temples in India are now drawing a line in the sand and are not providing information on how much gold they have. The gold stored in those temples was contributed by devotees over thousands of years and Hindu groups will not allow anyone to usurp it. Some temples actually believed the government and stored their gold in government vaults and when they try to get it back… They will find that their government can do miracles too…. It’s gone! 800,000 federal workers have been furloughed with the shutdown; however, with the government going from dysfunctional to nonfunctional, people may find out that they are more free now. A federal judge has rejected Holder’s BS about keeping the courts from wading into the “Fast and Furious” documents. Perhaps we will find that operation “Fast and Furious”, that resulted in hundreds of deaths of men, women, and children on both sides of the U.S.-Mexico border, was less about drug cartels and more about Holder’s contempt for the 2nd amendment and the U.S. Constitution. Both the USDA and the Bureau of Economic Analysis Websites went down because of the U.S. government shutdown. Gee, what a shame that we are not treated to more lies err… statistics of what a wonderful job they are doing. If only the other alphabet agencies could go dark, then we would all see what a black hole they truly are. Well, what can I say? I started this YouTube channel in January, 2010 to try to both entertain and inform people as to what was going on. 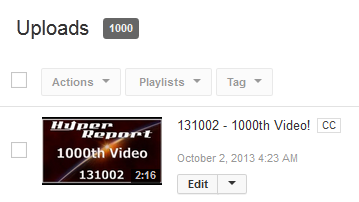 I never thought I would reach 1000 You Tube videos. I believe my ability to stay productive is because of the high quality audience I have attracted; therefore, I thank all of you. Will I produce another 1000 videos? We will see. This entry was posted in Video Resources and tagged 1000, Bank, Court, Dutch, Freedom, Gold, Impasse, India, Paychecks, Pension, Pensions, Shutdown, Temples, Videos. Bookmark the permalink.